Movies tell us that international spies only drive their cars for 20 minutes, max, before they blow up. Can Aston Martin build a flagship grand tourer you'd want to keep longer than that? Aston Martin, you splendid bastards. What am I going to do with you? There's so much in your stable to love, so much to laud, so much to extol. You've come so far, lo this past decade. Your cars no longer glide elegantly to a halt, having flicked off various belts at the merest hint of throttle. For that, I shall thank your mercurial, detail-obsessed leader Dr. Ulrich Bez in person, if I haven't already. Aston Martin, I'm ever in thrall of how you value design, following up Ian Callum with Henrik Fisker and then the brilliant Marek Reichman in the studio. The way you've employed a cohesive styling approach as, variously, a competitive differentiator, a brand unifier and a cost controller (why keep swinging when you've already hit a home run?). You've worked the James Bond renaissance wonderfully ("Skyfall" silver paint! ), and you've done more as a newly independent automaker than some brands accomplish under mega-auspices with far larger budgets, and even weathered a global economic screwdown with dignity and aplomb. You created a halo car, seven figures in price, as a technology exercise, then convinced people to buy it and used the tech and supplier relationships to improve your series line. Most specifically, in the new Vanquish. That was kind of brilliant. That's not to say everything's perfect. The competition keeps raising their game, in some cases with racing or just massive corporate R&D efforts providing even greater technology trickle-down, as well as trickle-up of the infotainment and convenience technologies that reign supreme in lower-priced automotive categories. Still, an infusion of cash from a new investor might change things, and I'm looking forward to the next generations of Aston Martin sexiness. 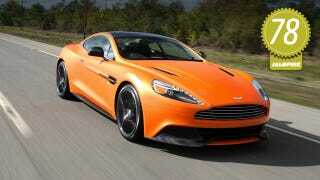 On to the Vanquish, now back from hiatus during which the DBS held the company's top spot. As a tip-of-mast entry, the Vanquish is brilliant, refined upper-class chariot with a tantalizing equilibrium of luxury and growl. Indeed, it's one of the most dynamic-to-drive and well-balanced grand touring cars in the world, and the best Aston yet to be built, with thousands of watts of charisma and curb appeal. And parts-bin signal-wiper stalks. Oh now, I'm just being cheeky. Are you done with the "Aston Martin look" yet? I'm not. Carp all you want that "all the cars all look the same," but it's one thing to share your face with siblings when daddy looks like Clint Howard, it's quite another when mommy looks like Minka Kelly. Whatever, mister "I'm so bored with the same gorgeous curves on every single car." Go leave a comment on the internet. The Vanquish is a bit curvier than its DBS predecessor, with more carbon fiber bits exposed for effect and more muscular flanks, with strong influence from the unobtanium One-77 super-ultra-megacar. All that means an uptick in the delicious column. It's beautiful to look at, it has presence and atmosphere and it's still less ostentatious than its competition, even in matte orange. Plus, the body is now a mélange of aluminum, magnesium alloy and carbon-fiber composite for extra exotica. Thank Aston Martin's moonshot, ultra-dollars supercar, the One-77 for the influence on the Vanquish's interior – a vast improvement over the DBS's. Arm rests that sink deeper into the door cards mean more comfortable elbows. New haptic-feedback buttons that make a noise when you sort of touch them replace some traditional switchgear, like for the infotainment system. They look cool and modern, and are a decent counterpoint to the typically beefy metal knobs elsewhere. That squarish steering wheel from the One-77 is an option for around a grand, and it's not the prettiest thing to look at. I kind of liked it, though, since I've picked up the habit of locking my thumbs into the wheel spokes when on the track, and the weird wheel made it easy. A simple round wheel is standard. The base car in the U.S. is a two-seater, but for around $4,500, you can get the beautifully clad but entirely futile rear seating package, which offers just enough room for a pair of declawed Tabbies and a cocktail bag, but not much else. Improvements to the wheeeeee12 — variable valve timing at intake and exhaust, improved intake manifold, and bigger fuel pump and throttle bodies — have lowered peak torque deeper into the rev range, making the Vanquish's muscular pull out of corners its most thrilling feature. It also has a seriously idiot-proof launch-control system that works like this: Foot on brake, press button, select first gear, release brake, plant foot on right pedal – and Bob's your uncle. The ZF six-speed autobox upshifts from first to second automatically, but the rest are on you. The pull isn't transcendently thrusty, but who needs to have their corneas flattened after every holeshot?. Drawing down a nearly 4,000-lb car from 135 mph into a gnarly hairpin is no easy feat. Nor is building a set of carbon brakes that feel as progressive as good, old steelies. These Brembos do both. My only quibble is with the pedal feel, which isn't aggressive enough for my personal taste, but certainly a nod to comfortable operation for the GT crowd. The Vanquish's ride quality on a dry racetrack with cosmoline-new tarmac is stellar. Surprise! Unfortunately, the only opportunity we had to test out the Vanquish's cragginess-management prowess was winging it over NOLA's curbings. In the stiffest track mode, but even better in the more compliant sport mode, the front-rear double wishbones and monotube adaptive dampers managed those candy-striped bastards without cracking a vertebrae or causing any losses in control. While the Vanquish not at its happiest when being tossed about with abandon, it's got fine track comportment, with updated steering that includes a quicker rack and a touch lighter feel (with new electronic assist), capable adjustable dampers that err on the side of comfort in Normal and Sport modes and additionally good roll control in the least-compliant Track mode (which we'd save for an actual track), gargantuan rubber and near 50-50 weight distribution. Indeed, the Vanquish is a very-good-handling large car. The new generation of Aston's adaptable VH structure is stiffer, using more carbon fiber as well as bonded aluminum, and 25 percent lighter, making for the most direct driver engagement of any Aston I can remember having driven. It's not the latest, eight-speed ZF kit, but the smooth six-speed works fine, and it's the software calibration that makes the Vanquish's paddle-shifted autobox truly track-worthy. Though an extra cog between second and third might give a little more punch to the 12. I didn't get a chance to do a full test of the 1000-watt Bang & Olufsen BeoSound, 13-speaker audio system, but after some noodling around I concluded it sounds good, but likely favors larger digital files over my more pedestrian rips, as is the case with some high-end systems. The good news is – with an exhaust lifted straight from the megabucks One-77— the Vanquish's updated 12 is the Lalo Schrifin soundtrack of engines. The power-up is mellow but exciting, if not an outright symphony of sucking, squeezing, banging and blowing, and a polytonal boom-blat on upshift delivers an extra drop of consciousness-heightening adrenaline. The good news is, Aston's ditched the previous Volvo nav system in favor of a new Garmin-sourced deck with 6.5-inch pop-up screen, as part of its new AMi package – which includes new satellite radio, iPod and iPhone integration and USB playback, A2DP Bluetooth audio and phone streaming, Wi-Fi Hub5, and haptic feedback controls. The bad news is the nav is still sub-par for its class. Oh my. This is a toughie. On one hand, Aston Martin still provides more X-factor appeal than any of its competitors. On the other, it costs $279,995 (including $2,600 gas guzzler tax) plus destination and delivery fee of $2,115, and there are cars in that ultra-luxury price range that offer more up-to-date technologies, affecting both driving dynamics and driver comfort and convenience. Still, it's a V12-powered Aston Martin sexpot, albeit one that costs as much as a country house. It's great to drive, has a nice, stiff chassis and decent suspension and excellent ride quality. It may not be for well-heeled, type-A OCD cases who cross-shop the latest and greatest with checklists in hand, or those who demand the most aggro drive. Ultimately, like the Bond flicks in which it stars, the Vanquish requires just a bit more suspension of disbelief to extract maximum enjoyment. Still, it's the best Aston ever built, and matches the company's evolutionary gait, and if you're fine with all that implies, then you'll love this car the most.